Three 12″ square studies, part of my exploration of compostion within a square. Each of these pieces include the technique of a tulle overlay. The tulle assists with construction and creates a muted tone. Both of these photos appeared on our fibergig Facebook timeline in September. Viewers commented that the products were quite disparate. Perhaps not many studios create a runway garment and a spiritual mural in the same summer. Actually, I use the same techniques to create all of my work. Often the role of the work itself is the same. 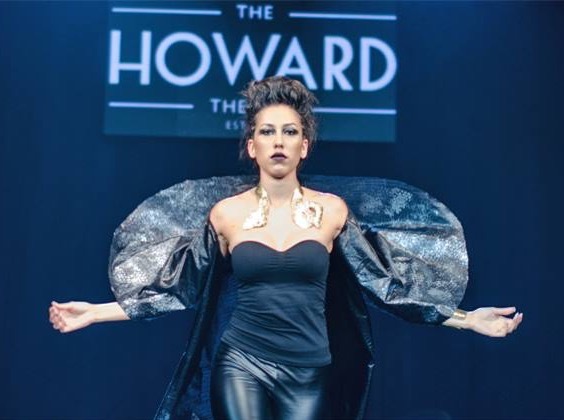 I designed the organdy black cape and several other garments for a runway show, in which several members of my Seeking Stars Art team were featured. The garments were to showcase jewelry and to energize the movement of the models. They played a beautiful counter-melody to the primary players. A congregation in Texas commissioned the large mural for its fellowship space. In the photo, the visiting bishop address the faith community about its vision for the future. Behind him, the mural is a visual reminder of the constancy of the Christian Trinity. It plays a silent counter-melody, fully supporting the message. I learned counter-melody in high school band, when I played the euphonium. Trombones to the left and tubas to the right blew out harmony and rhythm. Trumpets in front tooted the melody. But our small section, along with a few woodwinds, often had the task of enriching the sound with a secondary tune. Perhaps this is where my love of complexity began. This conversation was repeated at every 2014 craft market where I sold my L-shaped wraps. This week the light came on in the connection closet of my brain. Why am I not making scarves from raw silk? And here they are! 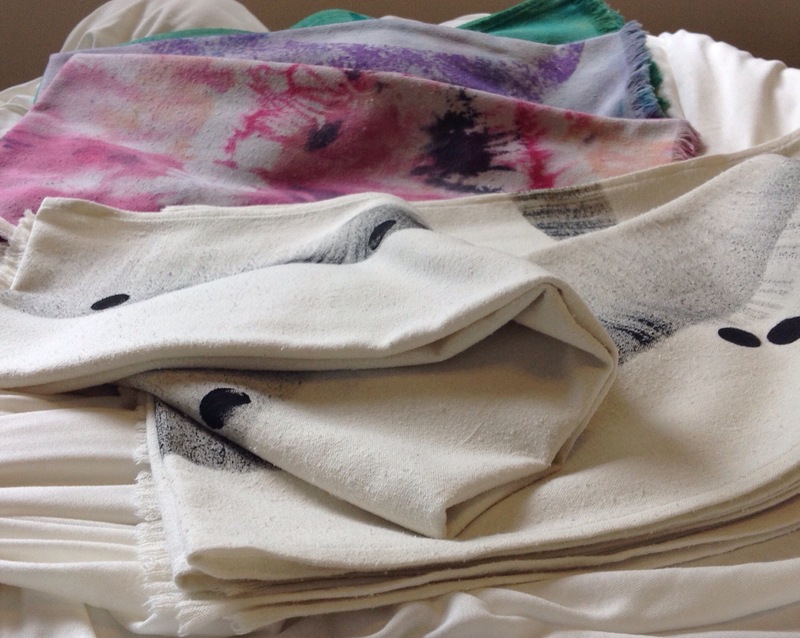 Prototypes with colorful dye and paint and also an elegant interpretation with black paint on the neutral silk. I use a small 1 inch fringed hem on the short ends to create a soft edge without fussiness; the long sides are double turned and stitched. They measure approximately 17 by 70″. A raw silk scarf can become an all season star: tucked under a coat collar, tossed over shoulders as a wrap, or twirled to create a spectacular neckline. They are not yet on the market, but will appear early in January 2016. Look for them at Seeking Stars Art. Occasionally my work returns to me for an adjustment or repair. The chasubles made for the chapel at The Village at Orchard Ridge were lined in slippery fabric, so that they hang away from the pastor’s alb. The Chaplin reported that they slipped backward during worship, becoming uncomfortable. We devised a solution of cotton “patches” added to the shoulder area. Future chasubles will have a yoke lining of non-slippery fabric . It is always a joy for me to participate in dialogue that increases the effectiveness of my work. I also enjoy the opportunity to touch and see what has gone into service. I began my professional life doing garment alterations while a college student. I am pleased to still include craftsmanship and individual attention in my toolbox of skills. 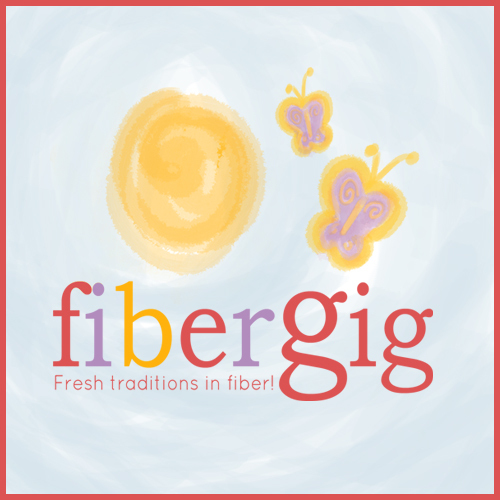 Fibergig is adding new tags to our scarves, garments, and stoles. We always check the fiber content of fabric and yarn before they are put to use. Fiber content often limits which techniques we can use in fabrication. It determines best options for paint, dye, pressing heat, and needle style. Fiber content gives clues about how the article will feel and how to care for it. We want you to know more. 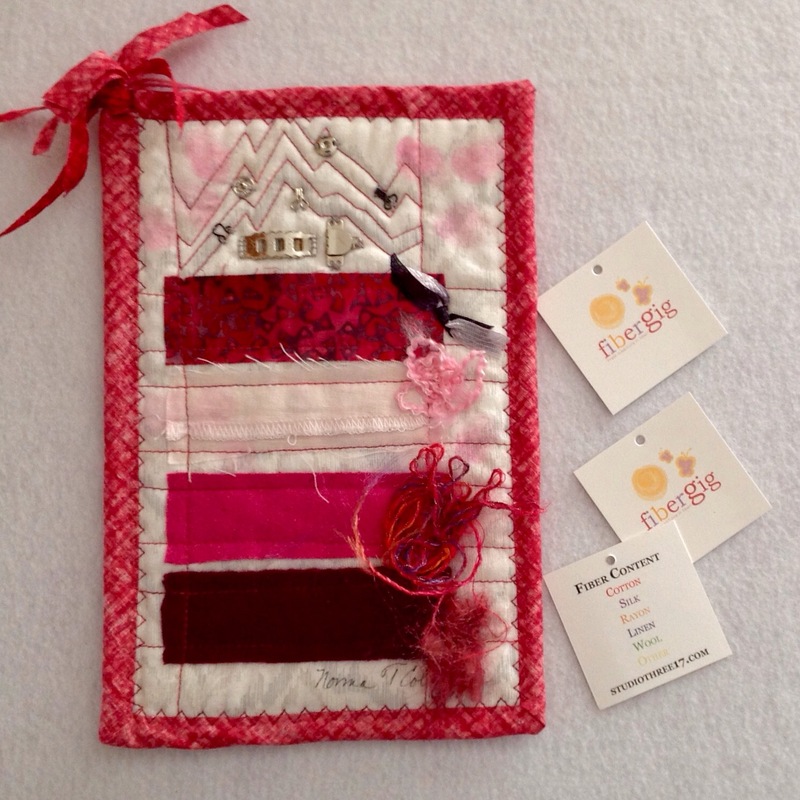 The new tags are photographed here with a small art piece which celebrates the touch of cotton, linen, silk, and wool. Look for the new tags on items available online at Seeking Stars Art and Fibergig. Our homepage includes buttons to get you there. My local fabric art guild does a monthly study on a given topic. “Sky” was a prompt recently. Avoiding blue, I chose black polyester organza screen printed with a bit of gray. 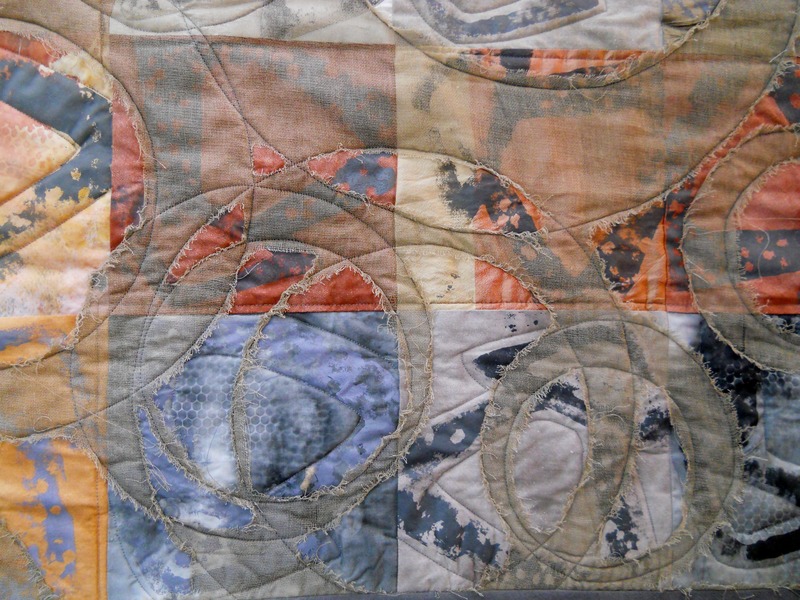 I cut and applied abstract shapes from hand dyed and painted fabrics for clouds and lightning. Then I was stumped on rain. I dipped a plastic wall scraper into metallic paint. 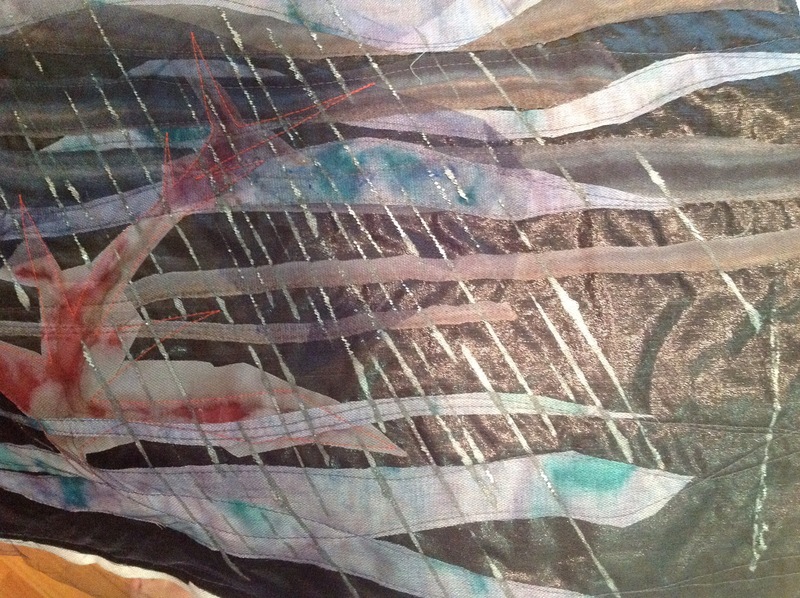 Applied repeatedly at an angle, the paint lines quickly created driving rain for my stormy night. I always set a time limit on the monthly studies. This boundary can be a catalyst for discovering new uses for tools and materials. How would you use a scraper? How would you make rain? Textile mural, 14′ wide and 7.5′ long. Constructed in 17 separate panels. Photo courtesy of Nancy DeForest. She snapped it with her phone as a great kindness to me. I had not yet seen all the panels hanging together because it is too large for my small studio. The happiest part of this mural project for me, the artist, is knowing that it will be used in the fellowship hall. During design and construction, I imagined members of your faith family pausing during a meal and using the mural for conversation. A father and his children play a counting game. How many trees? Flowers? Shells? Spirals? (Good luck with the last one.) Several older friends notice the storm near the cross and reflect about difficult times and drawing near to Christ. There is much of me in this mural: designs, fabrics, and techniques collected and evolved over years of work. Moreover, there is much of what has created the communion of saints in this mural. The mural conveys the mystery, joy, and energy of the triune God who is with us always. The prominent cross, representing Christ, is made with three layers. In the middle, a simple brown cross to recall the crucifixion. Under it, an expansive green net cross for the growing church. The top cross with red and orange flames represents spirit-filled Christians, especially remembering St. Stephen and those who worship in this congregation. God the creator is represented by the underground river, an omnipresent source of sustaining love, at the bottom of each panel. The dove symbol of the Holy Spirit, appears seven times. In the first panel, it ushers in the mystery of creation. The dove swoops down close to the baptism shell, then rises up to bless the elements of grain and grapes. With linen in its beak, it attends the cross. And it moves us out of the mural and into the world with an olive branch for peace. The making of the mural has been a journey of trust. My studio is too small to see all the panels at one time. First I made the cross. Then constructing the complex underground river got my mind and heart into work. I hesitated about the next step, but was blessed with the idea: work up from the river and out from the cross. That is how the panels were created. I built in both lively, colorful areas and quiet, meditative spaces. I worked for contrast so the doves are clearly visible. There are flowers in each of the liturgical colors: blue, green, purple, red, and white. One odd bunny snuggles at the foot of the cross. His name is Basil and he represents the child in each of us. He is there for comfort. The waywardness of the sheep in the pasture is intentional. Their theme song is “You can go your own way.” I like some humor in my days. When I realized I had technologically failed to secure all the photos I took of the panels before shipping, I panicked. I sat down, visualizing the mural hung in a dimly lit room. I was aware of the strong river and the prominent cross. And I sensed the dove moving through the space. My concerns ceased. All the colors, all the shapes, all the textures are secondary to the river, the cross, and the dove. God is with us. Amen. 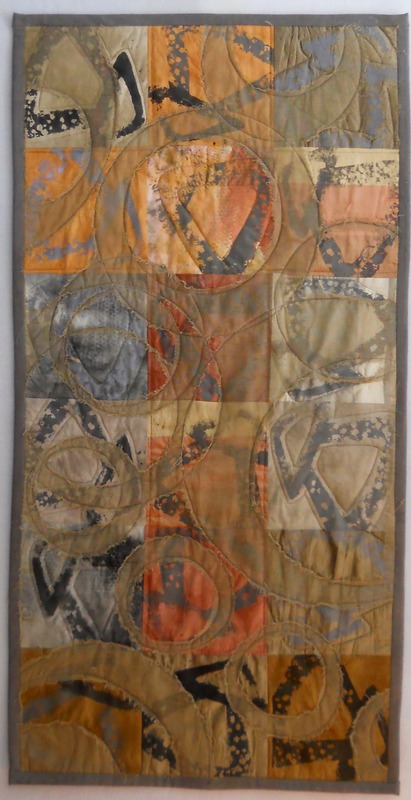 The 2015 Sacred Threads exhibition opened July 10 in Herndon, Virginia. 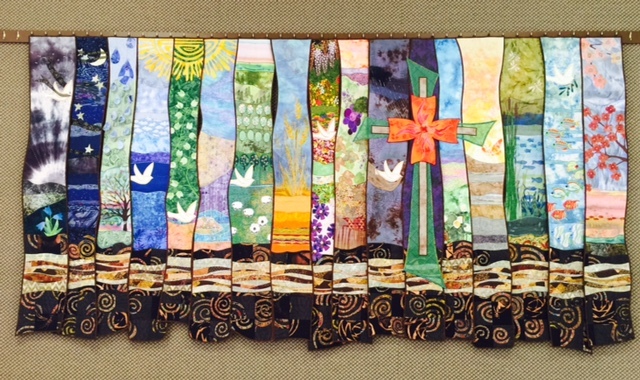 The exhibition is at Floris United Methodist Church through July 26, 2015. Two of my works are part of the liturgical section. Desert Meditation is part of the original concept: “the show conveys the spirituality, healing, and inspirational messages that transcend all people.” All three pieces are for sale. Contact me for more information. Make a triangle, find its shadow, and pair them up. Repeat squares. Print. Arrange. Compose. Repeated squares reveal a cross. Cover it all. Draw circles in the sand. Stitch the scrim. Cut. Leave the path of circles. Reveal the cross’s center. Create more shadow. Touch the shimmer. Fray the edges. I like to meditate alone during times of transition, before big decisions. This panel has been a quiet desert retreat in the year I became a wife, again. Complex images bring me clarity and assurance. 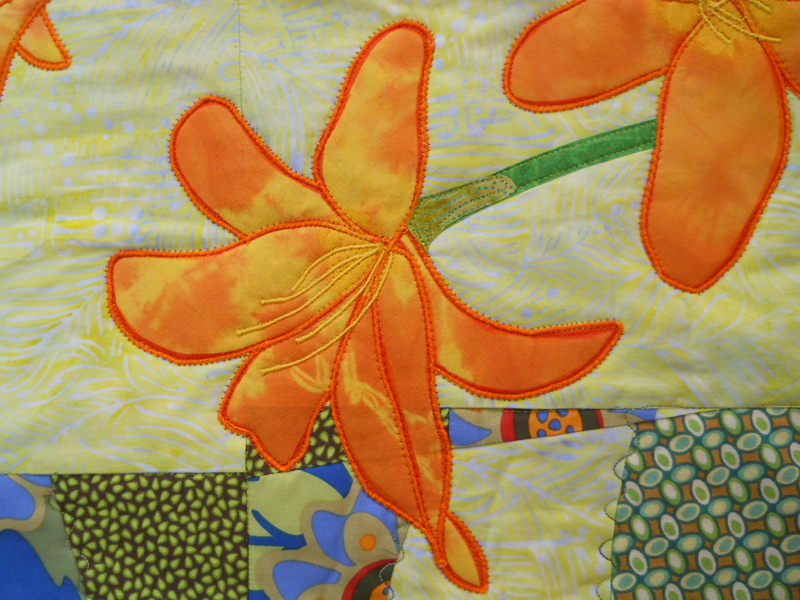 The 2015 Sacred Threads exhibition opened July 10 in Herndon, Virginia. The liturgical section includes two of my works, both inspired by daily life. The horizon line of the Blue Ridge Mountains is one of the delights of living in the Shenandoah Valley. All three pieces are for sale. Contact me for more information. If I were a psalmist, I would look to the Blue Ridge. Old mountains catch the mist, the snow. Green valley where I walk in daily patterns. And I raise my eyes. I lift my eyes. The hills have shadows and trees. Goodness is there. Help is present. 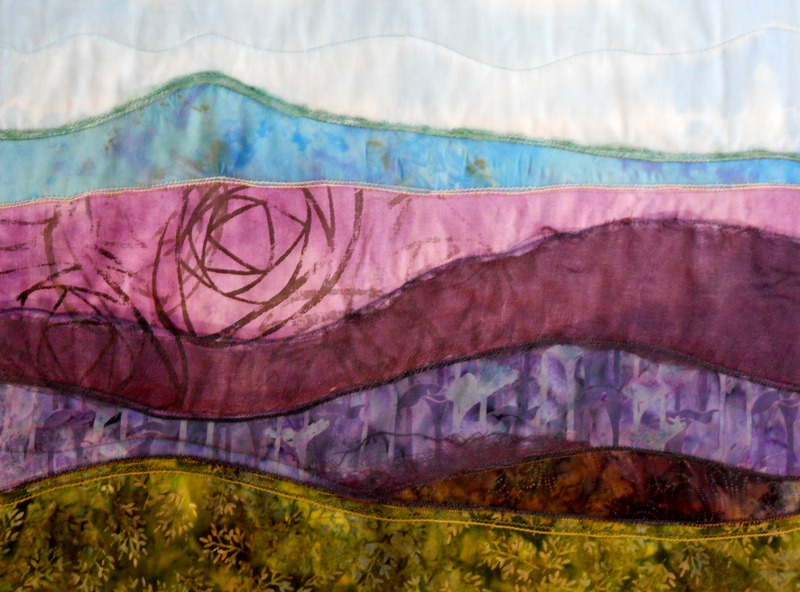 The 2015 Sacred Threads exhibition opens July 10 in Herndon, Virginia. The liturgical section includes two of my works, both inspired by daily life. The ubiquitous day lily stars in the first. All three pieces are for sale. Contact me for more information. Growing in your very own yard. Not the ones in faraway places. Not the ones on Easter altars. Consider these lilies. They neither sow nor reap. They bloom one day. That’s it. Of course, there are plenty of buds. Blossoms appear abundantly for many summer days. These one day bloomers persevere, returning each spring after deep cold, deep snow. Could I be of their stock? I will consider these lilies.